Book your stays at Zest Hotels and enjoy special rates at IDR 570,000 for 2 nights! Celebrate the holy month of Ramadan in Yogyakarta at Zest Hotel Yogyakarta. Enjoy special room rates start from IDR 250,000nett/ room/ night! Book Now and Save an Additional 15%! Simply enter 'BOOKDIRECT' into the promo code box and you can enjoy 15% discounts anytime! Book your stay at least 7 - 60 days in advance and save up to 30% off our Best Flexible Rate*! Online payment can be made using credit card, BCA Virtual Account, ATM/ Bank transfer, Mandiri Clickpay, CIMB Clicks and Permata Internet Banking. Enjoy and saving more with our room only rate at Zest Hotels in Airport Jakarta, Bandung, Batam, Bogor, Jemursari, Legian or Yogyakarta! Recharge yourself by staying at Zest Hotels in Airport Jakarta, Bandung, Batam, Bogor, Jemursari, Legian or Yogyakarta and start your morning with delightful international and Indonesian buffet breakfast at Citruz Restaurant. Enjoy special discounts up to 25% from our Best Flexible Rate for BCA credit card holders! Enjoy special discounts up to 25% from our Best Flexible Rate for JCB, BRI, ICBC and MayBank credit card holders! Special 25% OFF of Best Flexible Rate only for Batik Air Frequent Flyer! 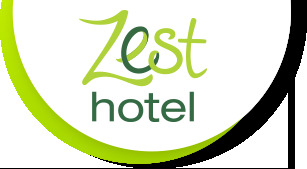 When you fly with Citilink you can stay at Zest Hotels for 2 nights for only Rp 550.000 including breakfast!